Pink Lemon Twist: A Sleeve! 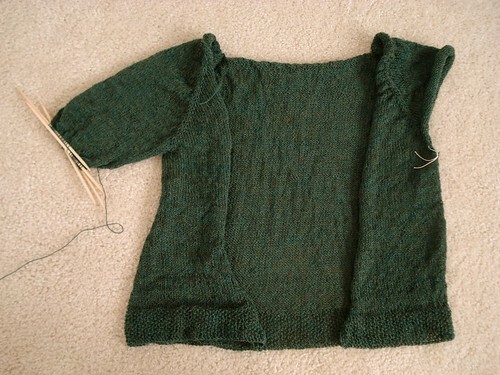 Over the weekend I finished up the Seed Stitch edge of the Forest Featherweight cardi and I started a sleeve. Picking up and getting started took a bit of time, of course, but once I got going, it started moving right along. I also wove in the ends left from the body before I started the sleeve, so I wouldn't have those flopping around. I'm using double points for the sleeves but I know there are a couple of brands of circulars that do very short lengths. I feel like I need to be very careful with double points so I don't snag the rest of the sweater, and I'm kind of wondering if anyone has tried knitting sleeves on the short circulars and how they liked them? I think the circulars would be less likely to snag - also, fewer points running around in the project bag. And for those of you would recommend Magic Loop or knitting on two circs at a time, I'm glad you enjoy those techniques, but I'm generally not a fan of circulars and the idea of these circular gymnastics makes me cringe. I've used the 9" circulars for sleeve cuffs and when dpns won't work. The needle portion is quite short, so I think it depends on how you hold the needles when you knit. I think they're ackward, because the needles are too short for the way I knit. My friend has every size of the Hiya-Hiya 9" and loves them for socks, sleeves, etc. I just got done with one of the sleeves for my featherweight cardi with my Harmony DPNs. I usually like knitting with DPNs but they have been killing me on this project! My stitches are very uneven. The second sleeve looks much better but there is still some uneven bits in between each DPN. I think it is the lace weight that is throwing me off. Anyway, I will probably be ripping them out and buying me some 9' circulars. I've been looking at the Hiya-Hiyas. I don't even like using circular needles for shawles, although I do use them. Since I try to keep my cursing to a minimum, I will struggle right along with dpns, even though they do tend to poke and snag finer yarns. I use circs almost exclusively. I'm a bit retro but my Boye interchangeable needles (picked up 2 sets on ebay for less than $20 each) are my absolute favorite. I can use whatever length cables work best for a project, although I prefer to use the two-circ method for smaller projects (baby hats, socks, and gloves).